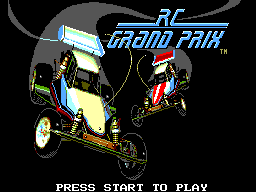 I like racing games, and R.C. 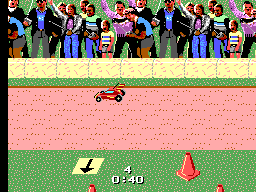 Grand Prix is a very nice type of a racing game. As I said, it´s a radio controlled car race. The goal is to pimp your car and win the races to be the champ. 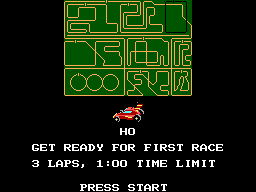 It´s similar to Buggy Run, but faster. You start the first race with a very slow car. If you win a race, you get some prize money and with this money, you can pimp your car with a new motor, battieries, tires, gears and more. There is only one curious thing: If you buy the Ultra Motor at first and start the next race, you will rush like a rocket from the starting line. I don´t understand this sharp distinction. But anyway, you will aclimate yourself and then it makes a good fun to play the fast races. Every race has a time limit. If you are too slow or you don´t reach the finish line as 1st, 2nd or 3rd, your game is over. But I think it´s doable to win. The multiplayer mode is the best thing in this game, especially with 3 or 4 players. If you play the game with one friend, you both will play with controller one and two. With 3 or 4 players, then you give controller one around. After every race, you have to "squarrel" with the other players about the upgrades. If you want maybe the Ultra Tires, and antoher player buys it before you can do it, it´s out of stock and you have no chance to get it or you must choose an another or slower upgrade. This fact makes the next races more difficult, because every player has another type of speed. The drag race brings more fun into the multiplayer game. All players will have a one on one race against each other. Be careful not to overheat your motor - At the bottom of the screen is a line. If you give gas, you have to let go back in time before the cursor touched the line. Otherwise, that race is over for you. But the official game goes on ;) I doesn´t like the fact, when you drive to the grass, it´s like you´re driving against a wall - You cannot drive over the grass. Why?? Really curious. But now, lets go over to the graphics.. The graphics are ok, but not awesome. The title screen looks very nice to me. The shop looks nice too with detailled auto parts to buy. Most of the time you see the grass and the racing track. The route could be more detailed, and it could be seen more things on the track. Otherwise the game is so fast that you will have no time to enjoy a landscape :D But anyway.. The people in the public are not animated and are programmed to repeat themselves like a wallpaper. The graphics are average. Hmm, there´s no much music to listen in this game. You have to listen to the theme on the beginnig, during the races and at the end. BUT, I like the theme. It fits good to the game. The sound of the cars´ motors is very good, even if you drive around the corner. As I said, the game is very fast. Before you reach every corner you will hear a jingle which helps you to react early enough. Overall - There is no much to listen but the sounds are ok. I think everyone must decide that for himself. Button 2 is not reserved in this game. Everything goes with button 1. I think a nitro boost would be a good idea for button 2. But there is nothing.. You will steering your car with the D Pad of course. You have to think that you are sitting in the car. If there´s a down corner, don´t touch down on the D Pad, but press left. Is there a up corner, press right. I think it´s easy to learn it. The only problem is, the cornering. A patient gamer could be very good at this game - But most of the time you can´t drive clear around a corner. Everytime you tend to crash against the "wall" (I mean the grass, see the last part of "gameplay" upper...). If you have bad luck, a bug occured. You CAN land on the grass. But it needs a long time to come back to the race track because you are slower than a snail. If you have a very fast car, the steering is a problem for inexperienced gamers. I don´t think it´s a good idea to play R.C. Grand Prix with a control stick because you need fast skills which gives you only a D Pad on the controller. The replay value is very high. You can train to be better and play it alone. But the fun key for that game is the multiplayer mode. It brings hours and hours of fun. I play R.C. Grand Prix as often as I can with my family.